Christmas is a time of massive inflow of Christians and Westerners into Puttaparthi. They come in different ways and by different modes, but arrive only for one reason - what Swami calls as "recharging their spiritual batteries." Traveling from far away countries to India and spending time here takes its toll on the energies and finances of these devotees. Therefore, most of them make a trip once a year. And having done that, they stay on for another 10-15 days and return to their homelands renewed, recharged and refreshed. That was the story of a group of devotees from New Zealand and Swami seemed to have decided that the "recharge" would take place for all of them on January 7. 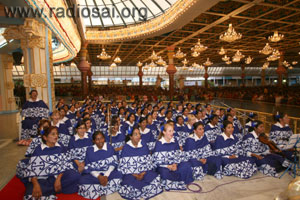 Swami had agreed for their choir programme and had also issued a very interesting command - that all the members of the choir should be seated on either side of the main stage, and not in front of the stage like other groups do. From 2 p.m. itself, all the members of the choir arranged themselves and tested out their instruments and the mikes. 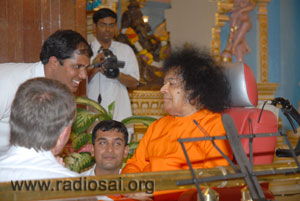 Swami arrived for darshan in the evening and took a detour at the ladies side itself and moved towards the stage. On the way, He spoke to some of the ladies who were part of the choir, and then slowly moved to the gents’ side of the stage, and then accepted their cards and programme schedule. Finally, He sat in the centre of the stage and sent the two students who were with Him on some errand. As He sat, He saw the ladies group from New Zealand which had spilt into two groups, with one group sitting below the stage on the granite blocks of the hall due to lack of space on the dias. Calling a student, He told him to take Him down towards those seemingly "unlucky" ones who could not make it onto the stage. He took a round around them and also around the entire ladies side! 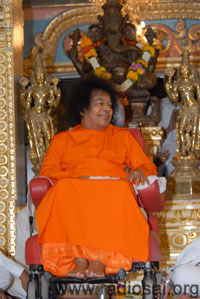 Finally, He came on stage once again and then blessed the Vedam to a halt so that the programme could begin. He was in for a surprise as the Maoris and the Kiwis began their own Vedic chants. This choir has been comprised of devotees who have been willing and committed enough to attend all practices, and had understood the need for and pledged to follow the 9-point Sadhana programme. There were visible signs of surprise on His face and He blessed the conductor to start the actual choir. 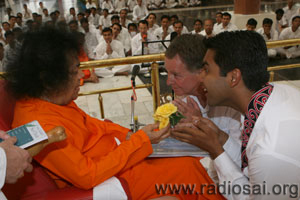 Before that, Swami blessed a green stone that the organisers presented Him with. The programme began with the energetic vocal Maori chanting by a Kiwi woman, and clearly Swami was impressed with her voice and delivery. Called the “Karanga”, it is the summon calls for the ancestors to the Lotus Feet of Swami. Then they began singing the "E Nga Iwi" as they called it. It was a hand action song, which depicted calling people to God. Swami looked at the actions to His left and right, and smiled in loving amusement. Swami was so engrossed that, to the members of the audience, He appeared like a spectator at a tennis match, watching the ball go left and right as He kept turning to both sides to watch the animated devotion of these sweet people from New ‘"Sai" land’ as they call it. ”Ti Hore Mai Te Rangi” was another dance performed by the girls and ladies. Involving concentration and dexterity, it made an interesting watch and Swami seemed very happy seeing it. One song that was sung was composed by one of devotees from amongst them while seeing Swami walking during darshan a few years ago. Their programme lasted about 45 minutes. As it concluded, Swami called the New Zealand woman who had chanted the “Karanga”. He spoke to her and then moved towards the ladies side. There, He materialised a gold chain for that lady and Himself put it around her neck. There was a loud cheer. Sarees were then brought from inside, and then Swami asked some of the ladies to distribute to all of them. He sat there personally supervising the distribution and also asked a few ladies, "Did you get a saree?" After ensuring that all had received His gift, Swami moved to the gents’ side and repeated the same shower of Love and Grace, with white Safari pieces this time. He blessed many of them with a word or two, and accepted their letters. Then calling the video cameraman Swami asked, "Have you covered everyone?" "Yes Swami! All have been covered." "Have you covered the ladies?" "Then? You said you covered all. The women must be covered too." "Swami, there is another camera covering them. This camera was for gents." The boy then told Him, "Swami there is a hair that has got into Your eye." He tried to remove it and then Swami shrugged him saying, "It is only hair, right?" Swami then gently took the hair out of His eye and neatly aligned it on His head. Seeing this, everyone burst out in happiness, and Swami looked so handsome and He too seemed to blush. 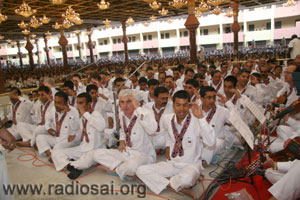 Swami then returned to the centre of the stage and asked for the bhajans to begin. Prasadam was blessed for distribution and as one bhajan neared completion, Swami asked for the aarthi. After the aarthi, Swami again interacted with the women on His way to the car, and thus ended another memorable day in Prashanti Nilayam.